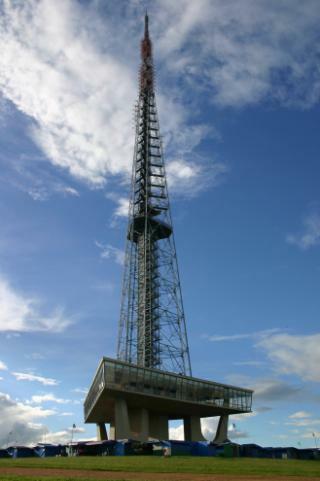 The TV Tower was designed by Lucio Costa as a refernece to the Eiffel Tower, to trasmit television and radio signals. It is one of the hightest towers in Latin America, 739.2 feet high. Elevators take visitors to the National Gems Museum, located on the first floor (82 feet high), displaying a variety of Brazilian precious and semi-precious gems, and to the 246-feet-high observatory platform, offering a 360-degree view of the city. The adjacent fountains, deliver different lights and water dance performances every day, from 6:30pm to 9pm.Considered one of the ten biggest in the world, its main pipe ejects water as high as 164 feet. On the east side sits the 40-feet-high Space Era, by Alexadre Wakenwith. A tour company offers 12-minute helicopter sightseeing flights. At the surroudning plaza, the crafts fair has been taking place for almost forty years, offering local and traditional handmade jewelry, embroidery, furniture, shoes, tapestry and ornaments. Wood, stones, clay and the cerrado flowers and seeds are also used to create beautiful colored handcrafts. Food stands sell a variety of Brazilian specialties, from the iconic sugar cane juice to pastries and authentic local meals. A large outdoor seating area is also available. Observatory and fair: Daily, from 9am to 6pm. Free admission. Fountain shows: Mon – Fri : 7am to 9am; 11:30 am to 2:30 pm, 5pm to 9p. Sat – Sun: nonstop from 6:30 pm to 9pm. Helicopter scenic tours: Daily, froom 10am to 7pm.